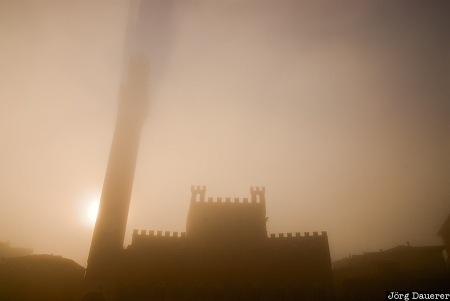 The silhouette of Palazzo Pubblico and the tower Torre del Mangia at Piazza del Campo obscured by thick morning fog in the center of Siena. Siena is in the central part of Tuscany, Italy. This photo was taken in the morning of a sunny day in October of 2009. This photo is part of the exhibition Urban Fog (October 2018). This photo was taken with a digital camera.